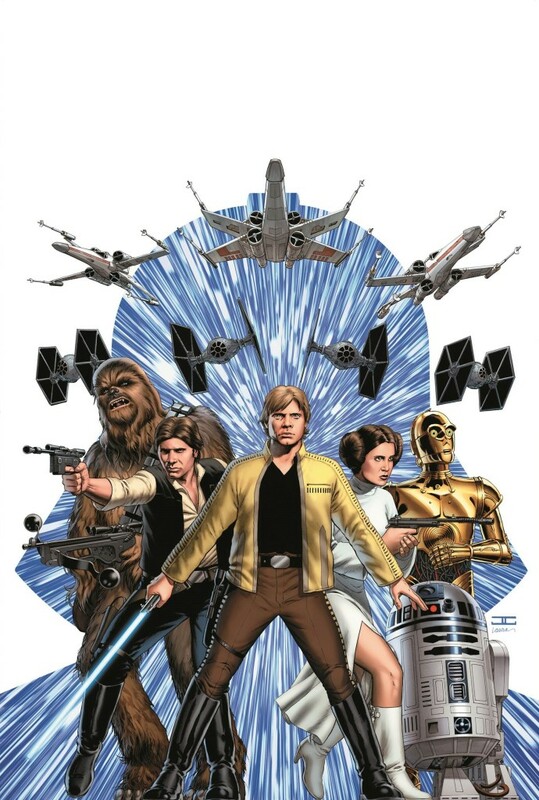 Finished reading Lords of the Sith, one of the new canon books that came out about a year ago now, and I have to say, this was a really great book. Of course, if you read the tweet up there, you’d know that already, but still! 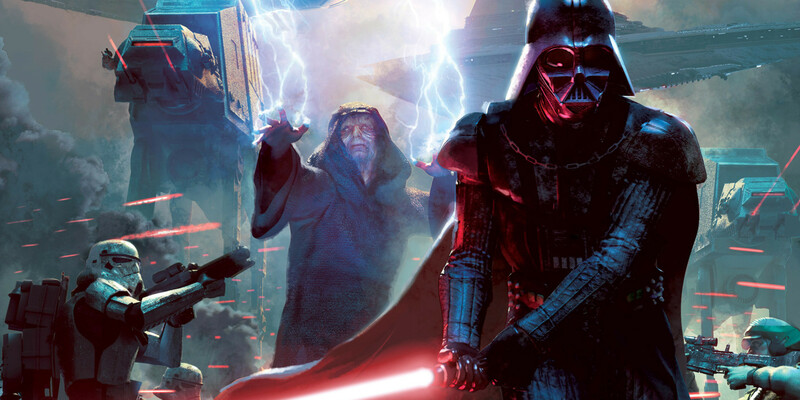 The book follows Vader and Palpatine as they are embroiled within a rebellion on the planet Ryloth. A lot is made of the time Anakin spent there in season one of the Clone Wars cartoon show – indeed, a lot is made of Vader’s past in general, and I have to say, I kinda like it! It feels quite similar to the flashbacks in Empire: Betrayal, an awesome comic book that I would recommend to anyone, even though it isn’t canon anymore. Only eight years have elapsed since the events of Revenge of the Sith, and Paul S Kemp has said in an interview that he wanted to show how Anakin became the badass Vader of the original trilogy, by purging himself of the memories of the past. It comes across really well, and I think it was one of the best parts of the book. Vader and Palpatine are targeted by the Free Ryloth movement, headed by Cham Syndulla (also of Clone Wars fame, and father of Rebels’ Hera Syndulla). The resistance movement is really interesting, and while I am a bit dubious at seeing these various, localised rebels at this time, feeling like we’re being led to seeing a kind of grand alliance of all the various cells into the Rebellion of the movies, at the same time it seems utterly believable, especially on a world like Ryloth, that is being abused by the Imperials for the mining of ryll spice. The Free Ryloth movement manages to destroy the star destroyer on which both Sith Lords arrive in the system, leading to something of a cat and mouse act as they are hunted across the surface. It’s kinda cool to see the two survive in the wilderness like this, though I was much more interested in the dynamics between them than the action scenes. Something I thought was really nice was that the captain of the Emperor’s Royal Guard is a clone trooper – perhaps Commander Thire? Something that should probably be mentioned here is the fact that Moff Mors is the first canon homosexual character, and unlike Sinjir in Aftermath, it’s almost entirely natural. The only mention that is made of it is when her wife’s death is described as sending her off the rails a bit. I like the fact that we can have a diverse universe without it being made an issue out of, you know? If I had to say anything against the book, there is something of a plot hole around Senator Orn Free Taa. I really liked seeing him again, it formed another nice bridge between the prequels and the new stuff. The Free Ryloth movement get wind of Vader and the Emperor’s visit, ostensibly by a traitor in the senator’s staff. It’s kind of the whole driving force for the plot. But Orn Free Taa isn’t really heard of again from the point where the star destroyer is destroyed. I think he’s described as making it to an escape pod, but we don’t know if he lives, and we never find out how Syndulla discovered the Emperor was coming to Ryloth. It’s hardly going to keep me awake at night, but I thought perhaps it should have been addressed? The book is quite short, 285 pages in hardback, so I feel there was plenty of room to tie up stuff like this. In the May 2015 issue of Star Wars Insider, John Jackson Miller wrote a short story called Orientation that takes place as Vader and the Emperor are en route to Ryloth. It’s a nice little story that shows there are still people loyal to the Republic out there, and features Rae Sloane (of both A New Dawn and Aftermath fame) as a mere cadet. Definitely worth the time picking up if you can still find it! 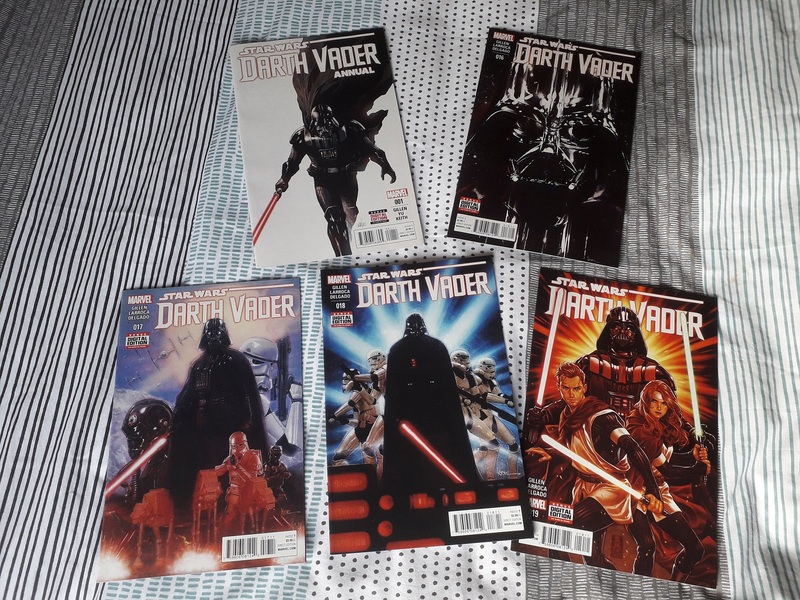 I’ve recently been reading the Darth Vader comics published by Dark Horse between 2011 and 2014, four arcs written by Haden Blackman and Tim Siedell. Bit of a mixed bag, if I’m honest, and pretty much all of them suffering from just-another-story-syndrome. 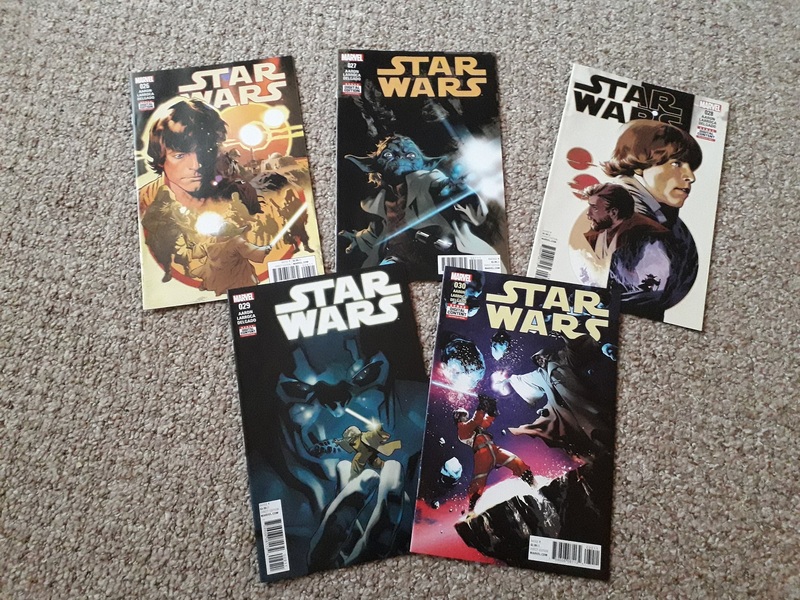 Back in the day, we used to get Star Wars stories that formed a cohesive narrative, predominantly in the novels of course, but series like Star Wars: Republic and Star Wars: Legacy showed that the comics could do that just as well. 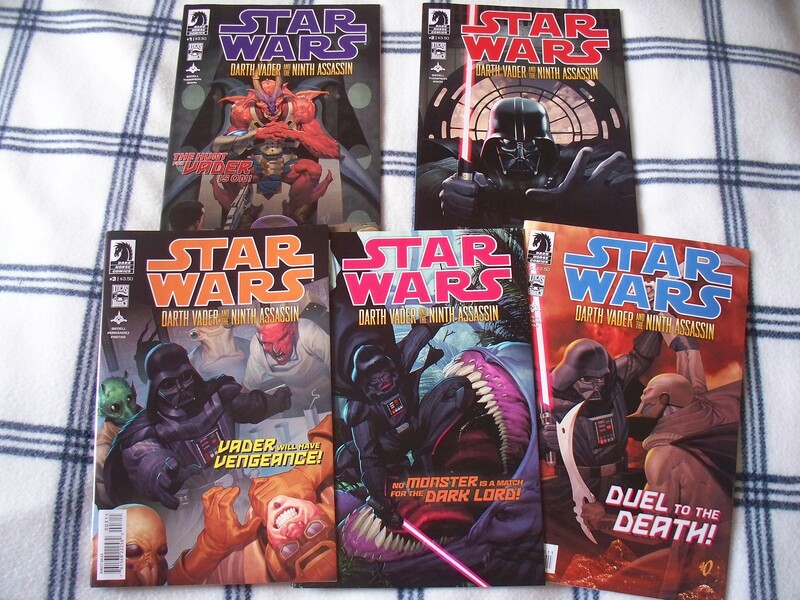 Following the release of Revenge of the Sith, however, both Dark Horse and Del Rey seemed to make a conscious effort to move away from providing an actual timeline, and instead opted to “tell a Boba Fett story” or, as is the case here, “a Darth Vader story”. The result tends to be a story that exists in a vacuum and, by the end of it, leaves you wondering just what the point of that was, in the grand scheme of things. Darth Vader and the Lost Command kicks things off with Vader leading a search for the son of Grand Moff Tarkin (who knew?) into the Ghost Nebula. There, they uncover a conspiracy for the Atoans to secede from the nascent Empire, under the leadership of Admiral Garoche Tarkin. It’s a pretty good story, actually, with some awesome fight scenes and a small cast of compelling characters. We see an interesting side to Vader here, where he is still stricken by the concluding events of Episode III. It’s a device that we see used first in Empire: Betrayal, which was published as the prequels were still being made, and seemed at the time to be a cheesy way to tie-in, but in retrospect seems entirely appropriate. That Vader’s memories here are being affected by the Atoan Shaman, Saro, is just more interesting, as we see what Vader had hoped his future would be. Very interesting, anyway! Darth Vader and the Ghost Prison is a more curious beast. Published in 2012, it tells the story of another insurgency against the nascent Empire, led by an instructor in the Imperial Academy on Raithal, a general named Gentis. His motivation is actually very compelling, that he is driven to despair over seeing so many of his sons killed in Palpatine’s name. However, as the story moves along, I found myself asking “so what, you’ll kill the Emperor, set yourself up in his place, and start having other peoples’ children die in your name? Jackass.” But maybe that’s just me. The story is told from the point of view of one of the Raithal cadets, Laurita Tohm. Disfigured in a terrorist attack on his family’s gas mining station, Laurita emerges as an ambitious lieutenant who I was worried would turn out to be one of these “I’m a good Imperial” types, but actually proved to be quite ruthless as the story got going. Gooooooooooooooooooooooood. The ending was really quite unexpected, but so very, very appropriate that I actually laughed aloud! Does that make me a terrible person? Well, possibly, but it was a good ending. 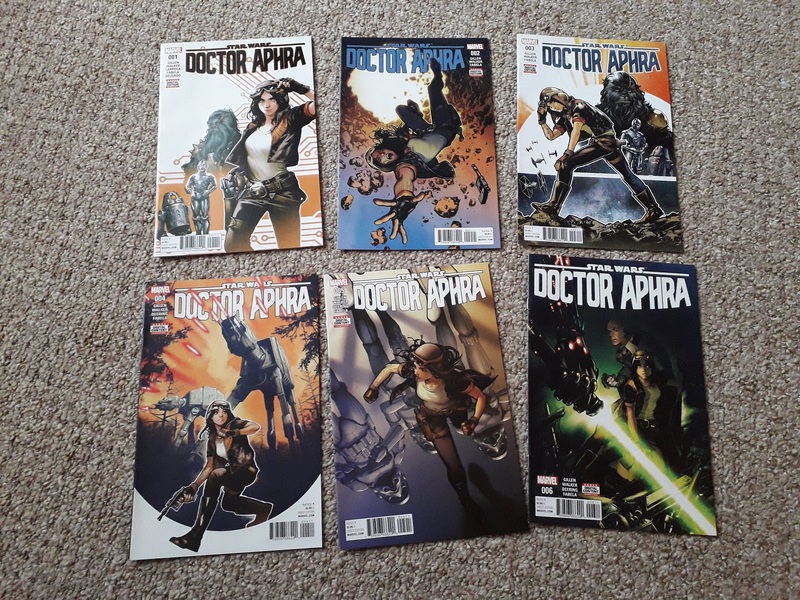 Something I was very excited about, seeing the cover of issue 4, was the appearance of Grand Moff Trachta. First introduced in the aforementioned Betrayal storyline, he has become one of my favourite Imperials, something that has really been heightened by the fact that, for years, he had only made one appearance in the literature. I’m going to be writing about the Empire storylines when I get to them, but for now, suffice it to say that he’s always struck me as a real Imperial’s Imperial, and I’ve longed to see more of him. However, his appearance in Ghost Prison, while entirely justified, fell much flatter than I’d hoped. In the end, he’s the one who turned out to be the Imperial-with-a-conscience, and the character felt cheapened for it. It felt like Blackman was trying to foreshadow the events of Betrayal by showing his disapproval of Vader and his methods, but I don’t think Trachta is the type to confide his feelings about the Emperor’s Enforcer to a cadet he barely knows. Hm. 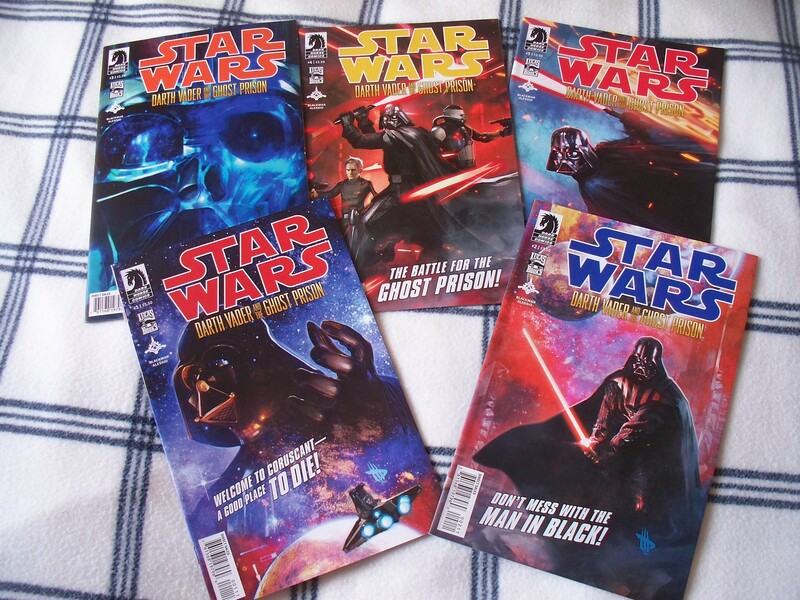 Of the two Blackman stories in this series, Ghost Prison definitely feels like “just a Vader story”. The whole point of it seems to show the Dark Lord to be a ruthless leader, but we already knew that. So, hm. 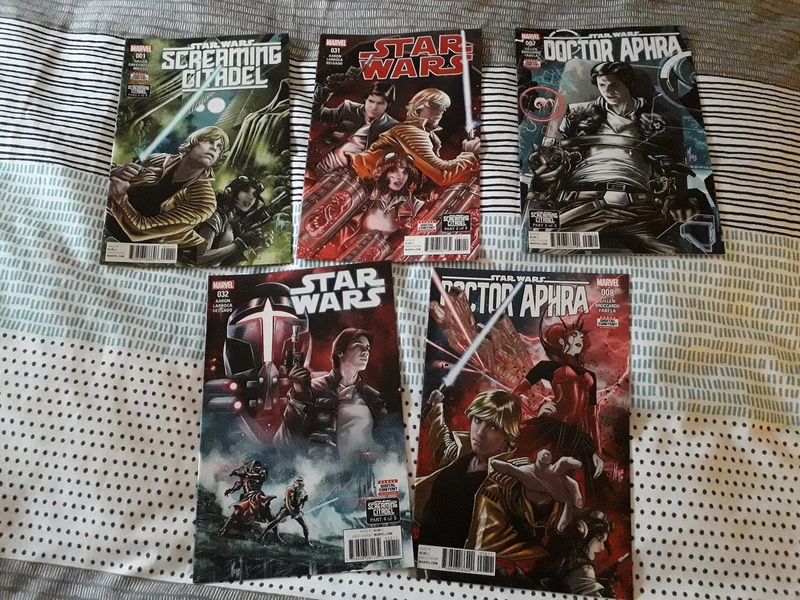 Darth Vader and the Ninth Assassin was published in 2013, and has always struck me as a wonderful title for a comic book series. As I’m sure you all know, Star Wars was heavily influenced by Oriental culture, and the title of this arc sounds like a samurai movie or something. To me, it does, anyway. This story was pretty good, too. I’m always a bit wary of such things – a wealthy industrialist’s son is killed by Vader, so he goes after revenge by hiring assassins to kill Vader, it seems so ridiculous a plotline! But then, we the audience have seen what Vader is like – in-universe (at least, in-Legends-universe), Vader is a shadowy figure sent by the Emperor to make things happen. Outside of the inner circle, very little is supposed to be known about him. As such, these kinds of plotlines are kinda forgivable. The conclusion was also really effective, with the Emperor proclaiming his dominion over Vader. Completely in-character, and quite creepy for it. All in all, this was a cracking tale, and ushered Tim Siedell into the expanded universe oh-so-late! Well worth picking up, even if you can only find it in hardcover. Darth Vader and the Cry of Shadows is the fourth in this quartet, and like Ghost Prison before it, is told entirely from the point of view of someone other than Vader. It’s actually an old Clone Trooper who’s doing the talking – an embittered clone who has come to hate the Jedi since they abandoned him to die, and sees in Vader something of a kindred spirit. However, things aren’t as rosy as he first thought in the New Order, and he eventually escapes for a more humble life. Clone Troopers with minds of their own have become a disconcerting theme in the wake of the Clone Wars cartoon series, one that must surely make the old clonemasters of Kamino pull their metaphorical hair out in the face of such failure. However, this comic shows that in a different light, and it actually becomes pretty compelling as a result! Despite the fairly grim narrator, there are some moments that made me chuckle. A lot of this one, however, felt a bit like some of the old Empire issues – particularly, To the Last Man. I suppose people want to see the Empire having crushing defeats as well as unbridled victories, but there were a lot of panels that put me back on Maridun with Lt Sunbar. That’s not to say it was a bad thing, of course, it just didn’t feel particularly fresh or anything. 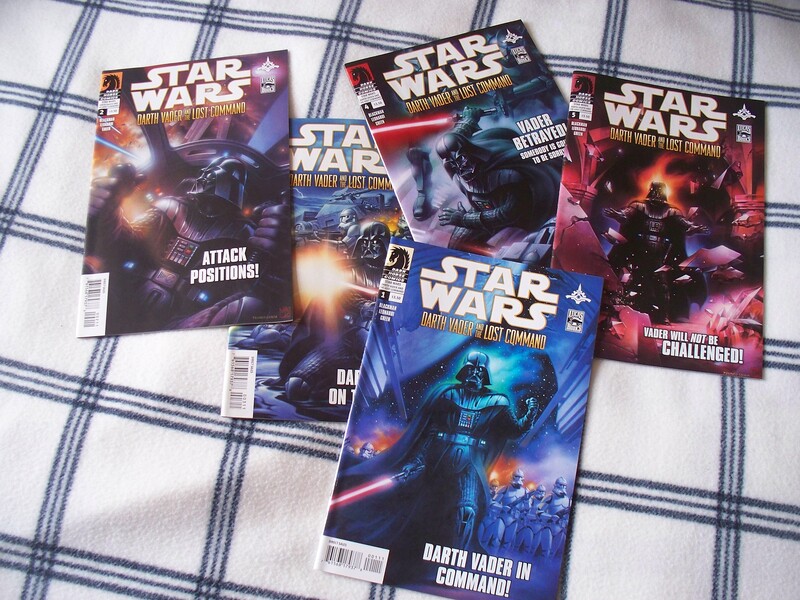 Coming towards the end of Dark Horse’s run in 2014, it’s almost tempting to think they shifted resource away from the Star Wars line to bulk out their other titles and ensure a continued readership into 2015, and certainly these issues are quite full of full-page adverts for their other titles. Maybe I’m just being cynical, however. At any rate, the main point of this story seems to be that, once again, Vader is a ruthless leader. In fact, there were a couple of points where Vader felt like an incompetent leader – while these stories are all set in the early days of the suit, Anakin was never supposed to be that bad in the Clone Wars. As someone who always led from the front, it surprised me that he would stay back here. Anyway. For me, this was a disappointing finish to the series, but the strength of Lost Command and Ninth Assassin tends to overshadow anything overly negative. So there you have it! 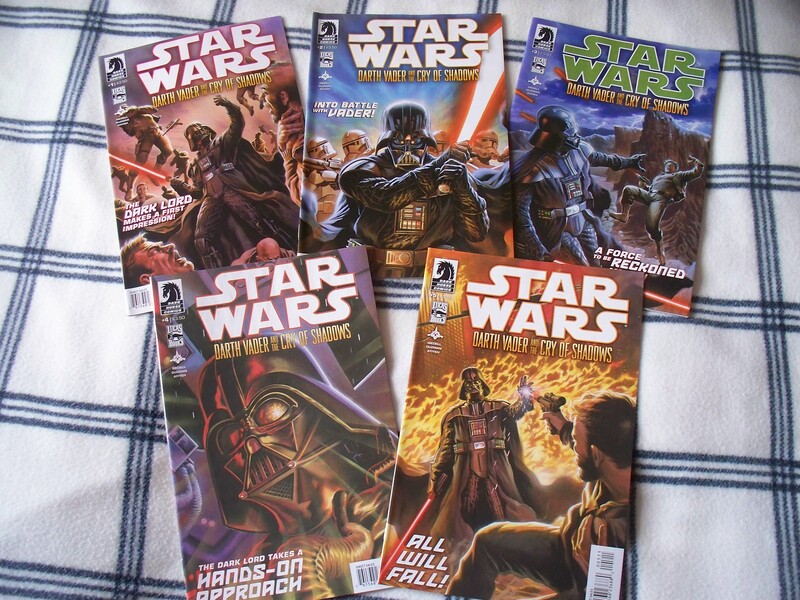 A bit of a mixed bag, and all of them unfortunately fall into the “just another Vader story” category. 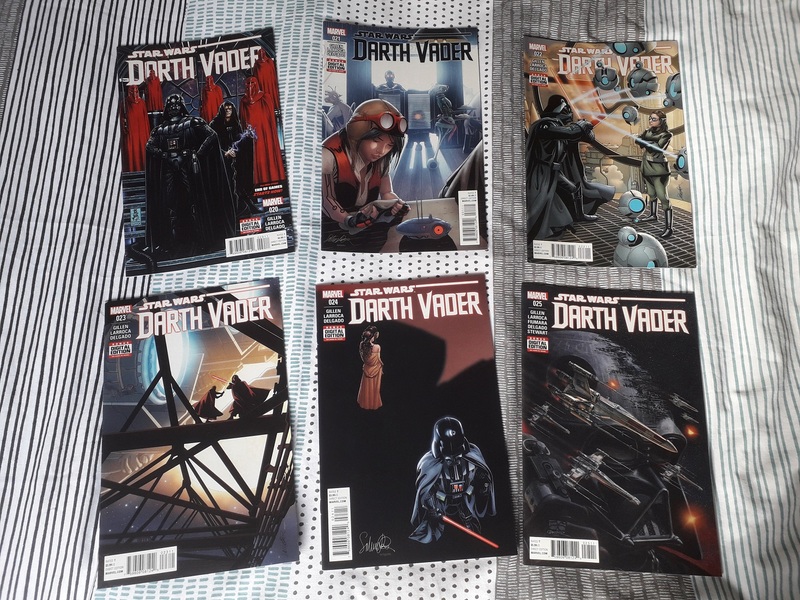 With Marvel’s ongoing Vader series starting imminently, I’m intrigued as to what they’re going to do about these things. The Marvel series is to be set between IV and V, of course, whereas all of these stories take place immediately after III, but given that Kieron Gillen basically has only the slightly nuanced movie villain to work with, it’ll be interesting to see what happens to the character this time around. There are nevertheless some really good books to be found in this series – don’t let the Legends banner put you off!